By this time World War II had been underway for nearly a year, and the German military saw the potential for such a craft. The RLM (German Air Ministry) redesignated the Fa-266 as the Fa 223 Drache (Kite), but as with many potentially advantageous aviation projects, the Fa-223 had to wait its turn in an industry inundated with new concepts and unprepared for a long war. In October 1940, Karl Bode flew the Fa 223 V1 to the RLM flight test centre at Rechlin where he demonstrated its startling performance by setting a new world helicopter speed record of 113 mph., a rate of climb record of 1732 feet per minute, and a new altitude record of 23,294 feet. By comparison, America's 1944 Sikorsky R-4B had a top speed of only 75 mph. and a ceiling of just 8000 feet. The RLM responded to the Rechlin demonstration by procuring 30 pre-production Fa-223s for development and service evaluation, and ordering the long lead time materials for a further 70. Unfortunately, in wartime Germany where priorities for vital materials were frequently switched according to whim or political influence, the Fa-223 was destined for the lowest priorities. The Drache was to be developed in five versions: the Fa223A anti s-submarine helicopter with the capacity of carrying either two 250 kg 9550 pound) bombs or depth charge; the Fa-223B observation/reconnaissance helicopter; the Fa-223C search and rescue helicopter; the Fa-223D transport helicopter; and the Fa-223E dual control pilot training helicopter. After making 115 flights the first prototype was destroyed on February 5, 1941, when a power failure occurred in a low altitude hover. The ship struck the ground so heavily that both outriggers failed. Shortly afterwards, the second prototype, the Fa-233 V2 (D-OCEW) was completed. While the first prototype had a nose with outward angled side windows, the second prototype had a glass nose made of flat glass panels similar to contemporary German bombers and, despite civil registration, had a nose mount for a 7.9mm machine gun. The third prototype Fa-223E V3 was built to the pre-production Fa-223E-O specification. By this time it had been decided to build a single multi-purpose version, instead of five different specialized versions. Auxiliary equipment that could be fitted were bomb racks, cameras, electric motor driven winch, rescue cradle, 300 liter (79 gallon0 drop tank, and wire laying equipment. The Fa-223 was like the FW-61, primarily constructed of welded steel tubing, with fabric covering the fuselage and tail surfaces. 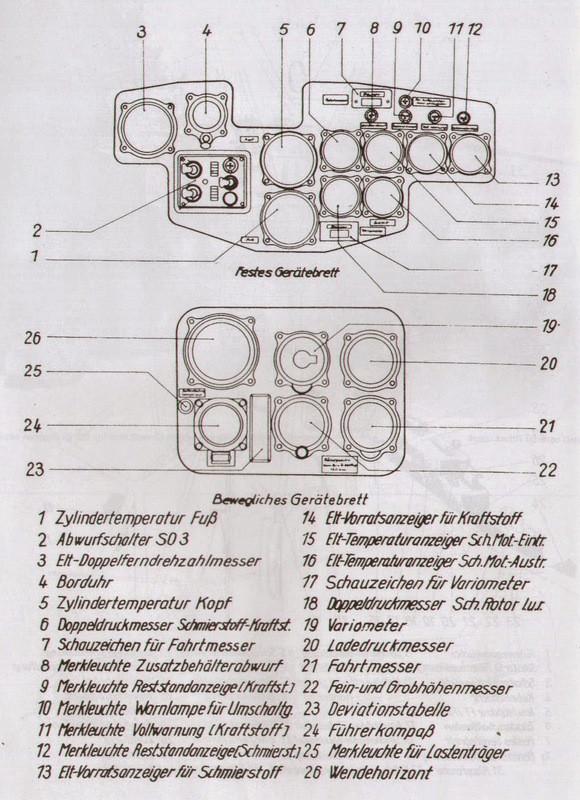 The nine cylinder BMW Bramo 323 radial engine was located behind the cabin and was fan cooled. The engine had a 1000 horsepower rating for one minute, an 820 hp. rating for 5 minutes, and a 620 hp. max. continuous rating. In June 1942, the second and third prototypes along with seven partially completed pre-production machines were destroyed by Allied bombers. A new factory location was setup in Laupheim in southern Germany, with production work resuming in February 1943. Karl Bode flew the first Laupheim built Fa-223E-O on June 21, 1943. This was the V11 which was finished in military coloring with the markings DM+SO. This ship was extensively filmed while making demonstrations of the helicopter's utility. The V11 exhibited its carrying ability by lifting such items as Fieseler Storch observation aircraft, an Me-109 fuselage, a one ton engine, and a Volkswagen military staff car. Fa-223 V12 was designated in September 1943, to rescue Benito Mussolini from his mountain prison. At the last moment, however the helicopter had mechanical problems, and a Fieseler 156 Storch had to be substituted for the attempt. Ship V12 would later be lost in an attempt to rescue 17 people trapped by heavy snow on Mont Blanc in France. 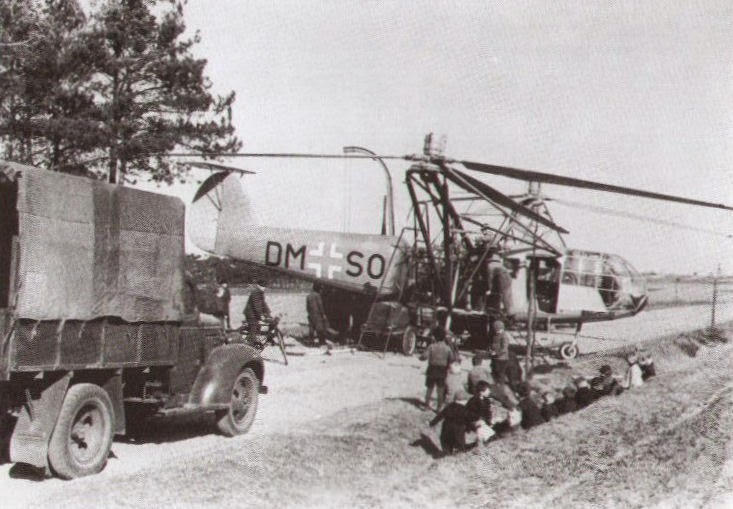 The helicopter had been flown on the long cross-country trip from Germany to carry out this humanitarian mission, and while attempting a landing on the mountain, a mechanical failure resulted in a rotor disintegrating and the ship hitting an embankment, killing the crew. In the spring of 1944 the V11 crashed while trying to recover a Do-217 bomber from the Vehner Moor. The Fa-233 V14 was then used to recover both the Do-217 and the unlucky V11. Two Focke Achgelis mechanics along with Luftwaffe personnel disassembled the two downed aircraft. Karl Bode along with Lt. Helmut Gerstenhauer, the Luftwaffe's most experienced helicopter pilot, made ten flights on May 11, 1944, followed by further flights the next day. The major components of both crashed aircraft were picked up from the marsh and carried out to a road where they were transferred to a truck. Only seven Fa-233 helicopters were built at Laupheim, before this factory was destroyed. An Allied bombing attack in July 1944 hit every building in the factory complex except for the wind tunnel, wiping out the complex. The existing Fa-223 helicopters carried on in demonstrating the usefulness of vertical flight aircraft. Two of the Fa-223s were used in manoeuvres at the mountain Warfare school in the Alps near Innsbruck during September 1944. Ships V14 and V16 were utilized to supply the mountain troops. The aircraft flew 83 missions, flying on 29 of the 30 days. The one day of non operation was due to fog so thick the pilot could not see the tips of the rotors. Seventeen landings were made on sites that were 4500 feet or more above sea level, including three on the Dresdener Hutte, at an elevation of 7600 feet. The extensive manoeuvres demonstrated the helicopter had a place in mountain warfare. The Fa-223 could lift 1100 pounds of provisions to a remote site at an elevation of 6500 feet in just seven minutes, a feat that would require twenty men, a day and half of strenuous climbing, to accomplish, in one fifteen minute round trip flight from the base at Mittenwald, a mountain howitzer and its ammunition were lifted on a cable below the helicopter, then flown to, and safely lowered to a position just below the Wornergrat peak. The gun had to be winch lowered, because there was not enough room to land. The Fa-223 was used as a troop transport during manoeuvres and carried as many as 12 troops in addition to the pilot. Four men were carried inside the cabin and eight were carried on tractor seats fastened to the outriggers. When the mountain manoeuvres ended on October 5, 1944, the head of the Mountain Warfare School enthusiastically endorsed the Fa-223 and everyone expected that there would be a push for production of the Drache, instead, on October 11th, an order was received from the Air ministry to stop all work on the Fa-223 and transfer all Focke Achgelis personnel to Messerschmitt. The Me-262 jet fighter required all the skilled labour available for production and as the Allies closed in on Germany from east and west, factories were being set up in remote areas, away from the bombing devastating German industrial plants. In December, the Air ministry did an about face and ordered Focke Achgelis to be re-established at Tempelhof Airport in Berlin and to begin producing the Fa-223 at a preposterous rate of 400 per month! This lunatic order was issued despite the fact that all tooling had previously been destroyed in bomb raids and there were nowhere near enough aircraft workers left to perform such a task, even if the tooling did exist, but professor Focke once again went to work setting up a helicopter factory. Five of the seven Fa-223s built at Laupheim were still flyable and three of these were turned over to the Luftwaffe for use by its recently activated helicopter squadron Transportstaffel 40. This unit was formed in early 1945 at Muhldorf, Bavaria, and operated a mix of Focke Achgelis Fa-223s and Flettner Fl-282s. The organization under the command of Hauptmann Josef Stangl moved to Ainring near the German-Austrian border and then to Styria in Austria to preform artillery observation, liaison, and transport task in support of the hastily improvised Luftwaffe division, north Alp. Once in Austria the unit began a retreat back to Ainring in the face of the advancing U.S. 80th infantry Division. Some of its helicopters were captured along the way, others were destroyed by their crews, after forced landings. The two Fa-223s and the few Fl-282s that made it back to Ainring, were captured by the onrushing U.S. forces. Meanwhile, the Tempelhof produced Fa-233E was delivered to the Luftwaffe and by "Order of the Fuhrer' on February 25, 1945. Ordered to fly to Danzig. It took off from Tempelhof the next morning to proceed on its mission. Due to dodging storms, Allied bombing attacks, advancing allied forces, and having to search for fuel, the helicopter's pilot did not arrive on the outskirts of Danzig until the evening of March 5th. There, because of advancing Soviet forces, it was now impossible to fly into the centre of Danzig as ordered. While awaiting orders on where to proceed, the crew got word that a fighter pilot had gotten lost in a snowstorm and had made a crash landing. Lt. Gerstenhauer took off in the Fa-223 and proceeded to search the area. The helicopter crew spotted the downed Me-109 with the injured pilot still in the cockpit. They rescued him and flew him back to the base for medical attention. By this time, Danzig was falling to the Russians, and the Fa-223's crew took off to try to reach a safer haven. Fuel was still a problem and when they did find a fuel stockpile, they realized that the Allies push had captured or destroyed all the friendly airfields along their projected route. After topping the tanks off, they loaded a 55 gallon drum of gasoline and a hand pump on board, took off and overflew the Soviet forces. When they finally put down at the German base at Werder, they had flown a total of 1041 mile on this escape mission. After a rest the ship was flown to Ainring to join Transportstaffel 40, only to be captured by American troops. Three Fa-223s were in final assembly at Tempelhof, along with 15 partially assembled ships, when the Soviet forces captured the Berlin airport. The Americans turned over Fa-223E V14 to the British for evaluation. At the time of its transfer, V14 had logged 170 flying hours, more than any other helicopter in the world. On July 25, 1945, ex-Luftwaffe Lt. Gerstenhauer (officially a POW), flew V14 with Sqn. Ldr. Cable, RAF and Lt. Buvide, USNR, from Germany, to the French coast and then on to England where they landed at RAF Beaulieu. This was the first crossing of the English Channel by helicopter, but while undergoing flight evaluations in England, V14 was destroyed, due to a mechanical failure in the drive system. The Fa-223 that had made the Danzig trip was painted with U.S. markings and was scheduled to come to the United States for flight evaluation. It is not known if it ever actually made it to America, but there were other Fa-223 survivors. In addition to the Tempelhof assembly line, a second Fa-223 production line was being set up in occupied Czechoslovakia. After the war, two of its partially completed airframes were assembled and flown at the Avia plant. Luft-Transportstaffel 40 based at Ainring in April 1945, had at least three Fl-282s (and also three Focke Achgelis Fa-223s) at its disposal. During the last few months of the war and this unit made many flights into and out of besieged and encircled towns transporting dispatches, mail, and key personnel. It was possibly one of this unit's Fl-282s that flew Gauleiter Hanke out of besieged Breslau just before the capture of that city. If Benito Mussolini would be rescued by the Fa-223 V12, as initially intended, the apparatus would be by far more famous, now and then. If think that was the day when the German helicopter missed the chance for celebrity. Hanke had flown out in a small Fieseler Storch plane kept in reserve for him. 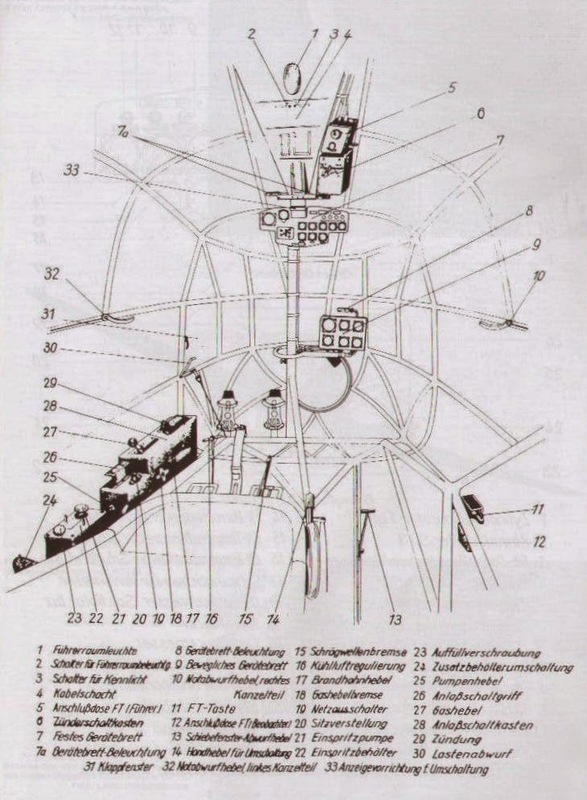 In his memoirs, German Minister of Armaments, Albert Speer, claimed that he heard from Anton Flettner, the designer that Hanke actually escaped in one of the few existing prototype helicopters.